The U.S. has yet to uncover any evidence showing China sold arms to embattled Libyan leader Moammar Gadhafi or his loyalist forces, a senior Obama administration official said Monday. When pressed by administration officials, Chinese leaders confirmed talks did occur, Susan Rice, Washington’s ambassador to the United Nations, told reporters. Filed under: Beijing Consensus, Chinese Model, Foreign aid, Influence, International Relations, Libya, military, Politics, Public Diplomacy, Strategy, U.S.
Litmus test indeed; this article is a month old but useful to juxtapose against what’s transpiring today. A failed Libyan state is not a scenario in the interest of China as it is one of China’s major sources of oil (150,000 barrels a day last year, a tenth of Libyan crude exports). It will be interesting to see how Beijing plays around with its non-interventionist soft power principles in foreign affairs to keep this resource and deployment stream alive and kicking. In more recent news – ‘China on Tuesday urged Libya to protect its investments and said their oil trade benefited both countries, after a Libyan rebel warned that Chinese oil companies could lose out after the ousting of Muammar Gaddafi’ (Reuters, August 23, 2011). Certainly, the matter is compounded by ‘partnering rogue state’ reports such as when ‘China broke UN embargo to sell arms to Gaddafi‘. The Libyan case does provide Beijing a momentum to review its foreign policy. On Mar 17th, Beijing made the unusual decision not to utilize its veto power to let the military strikes move forward. This authorized the establishment of a “no fly zone” over Libya and the use of “all necessary measures” to prevent civilians from being attacked by forces loyal to Muammar Qaddafi at the United Nations Security Council vote on resolution 1973. Unusual because this marks the first time that China chose not to block Security Council-backed military measures against another government for human rights or humanitarian causes. 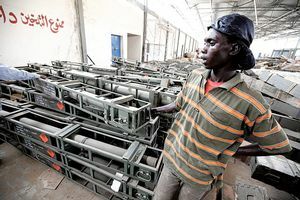 State-controlled Chinese companies apparently sought to sell arms to the Gaddafi regime for use against the rebel army despite a UN embargo against such sales, according to official documents found in a bin in Tripoli. The documents, uncovered by a Canadian reporter, show that members of the former Libyan government visited Beijing in July, when the war against the rebels and Nato was in full swing, and met representatives from arms companies in a bid to buy weapons from the Eastern superpower. 4,000 tonne Chinese frigate off the Libyan coast amidst China’s condemnation of Libya air strikes. This is the first time a Chinese warship has ever sailed in the Mediterranean sea. This time it’s for humanitarian reasons – to evacuate its people, but the side effect of a display of military power overseas can not be missed; especially in a region where it is quickly making friends to secure commercial and resource interests. Another article on China’s ‘condemnation’ of Libya airstrikes. About half of China’s crude imports come from the region. Pursuing its commercial and energy interests in the region means balancing friendships with Middle East countries whilst handling the spectre of western demands. “China’s influence in the Middle East has grown steadily, reflecting its economic growth, and that will oblige China to speak out more about regional affairs…” Guo Xian’gang, vice president of the China Institute of International Studies in Beijing. The Middle East is an important source of oil for China. On the weekend, Saudi Arabia‘s Aramco announced its latest proposal to supply crude to a refinery in the southwest of China, where Beijing is building an oil pipeline that slices through Myanmar. About half of China’s crude imports last year came from the Middle East and North Africa. China wants to diversify supplies, but Arab countries and Iran hold so much of global reserves that they are sure to remain major suppliers. “China’s influence in the Middle East has grown steadily, reflecting its economic growth, and that will oblige China to speak out more about regional affairs,” said Guo Xian’gang, vice president of the China Institute of International Studies in Beijing. Like Russia, China opposes military action in Libya within the 15-member United Nations Security Council. Foreign Ministry spokesperson Jiang Yu on China’s official stance – it opposes the use of force in international relations. China has expressed regret over the multinational air strikes in Libya, saying in a foreign ministry statement that it opposed the use of force in international relations.